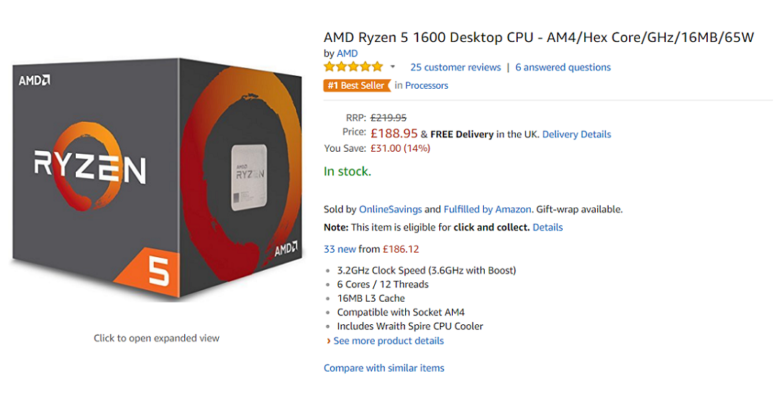 AMD Ryzen 5 1600 has become Amazon UK’s best selling CPU thanks to its incredible performance/price ratio. The Ryzen 5 1600 is a 6-core, 12-thread chip built by disabling two out of eight CPU cores physically present on the 14nm Summit Ridge chip. This is, in turn, one core per CCX module (quad-core complex), , while leaving L3 cache untouched. So the 1600 features a staggering 16 MB of shared L3 cache and 512 KB of L2 cache per core. The chip runs at 3.2GHz base and 3.6GHz of turbo frequency. It has a TDP rating of 65W and supports the AM4 socket out of the box. The 1600 directly competes with Intel’s i5-7600 (non-K) quad-core chip. 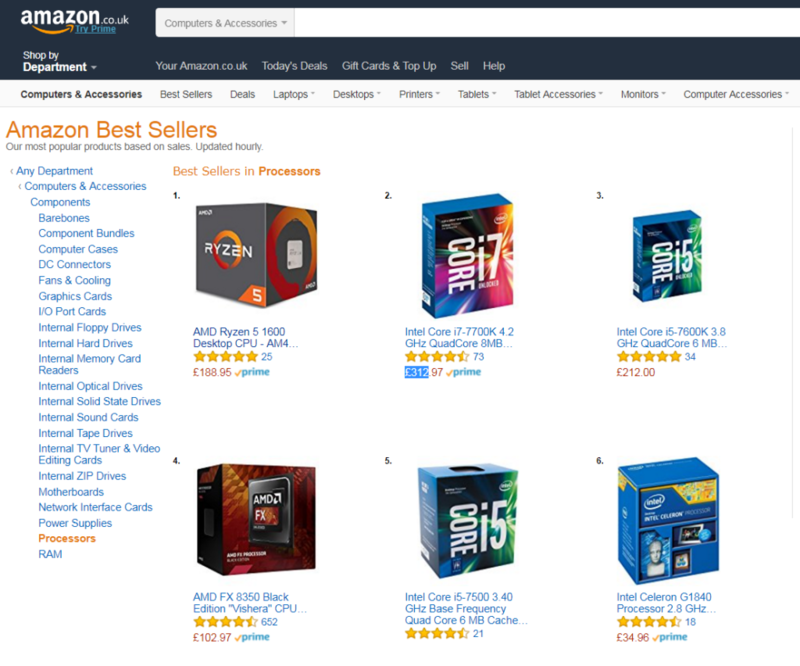 The £189 Ryzen 5 1600 now occupies the first spot on Amazon UK’s best sellers list for CPUs. The chip displaced Intel’s widely popular £312 Core i7-7700K from its top spot to lead the list. 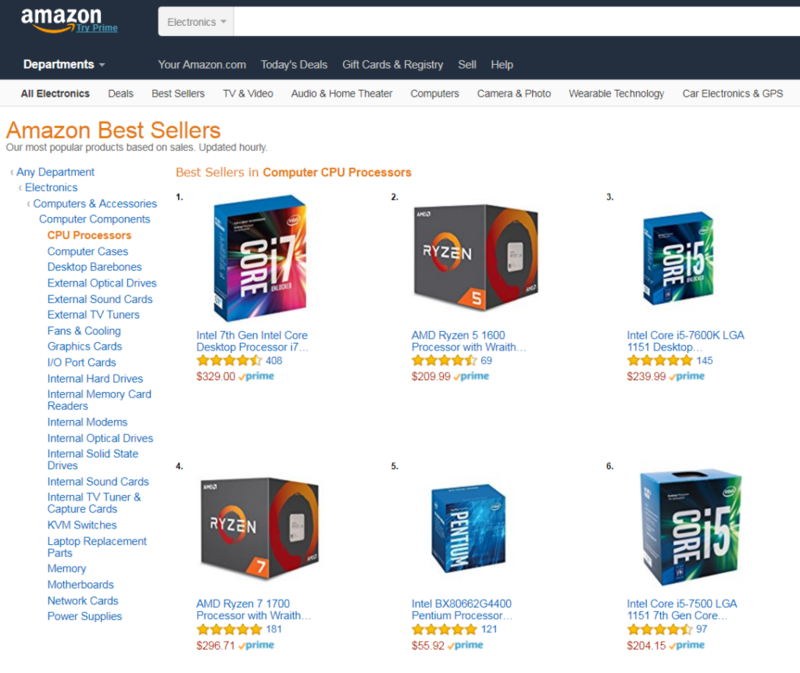 There’s a total of three AMD Ryzen CPUs in the top 10 best sellers list; the other two being the Ryzen 7 1700 and Ryzen 5 1600X which hold the #9 and #10 spots respectively, at the time of writing this post. Across the pond on Amazon.com, the $329 Core i7-770K is still the best selling CPU while the $210 Ryzen 5 1600 occupies the #2 spot. The Ryzen 7 1700 and Ryzen 5 1600X again manage to make it to the top 10 list. This shows a strong demand for more affordable high performance desktop CPUs. Overall, AMD Ryzen processors received positive reviews from critics and users alike. There are only a couple of issues that work to undermine the new CPUs: one is that the gaming performance is not what many expected it to be, and the second is memory compatibility. AMD has already addressed the former, saying the gaming performance will increase in time as more developers start optimizing their games for Ryzen. Back in March, the company announced it worked with Oxide Games to optimize Ashes of the Singularity: Escalation with the new build offering up to 30% faster performance on the Ryzen 7 1800X CPU. 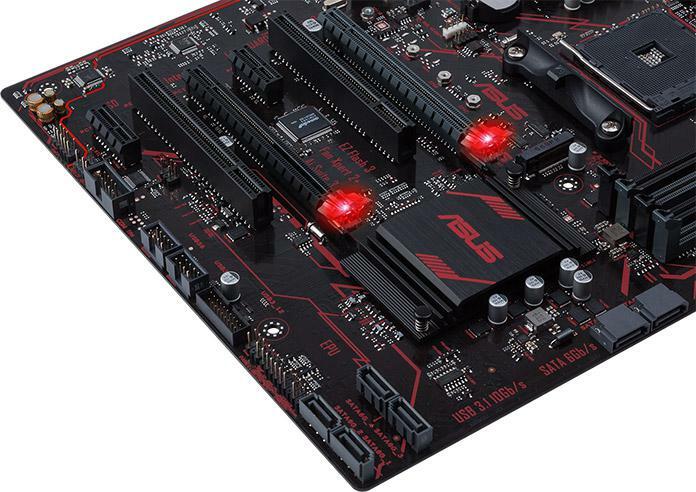 In regards to the other issue, AMD released a new Ryzen AGESA 1.0.0.6 microcode a month ago, which enhances memory overclocking and compatibility. The firmware adds support for 26 different high-end memory kits with memory clocks expanded all the way up to DDR4-4000. The Ryzen 5 1600 is priced at US$219 between the Core i5-7600, which costs $229, and the i5-7500, which goes for $199. People who can’t afford the i5-7600K, but want a similar level of performance with no plans of overclocking their CPU opt for the cheaper non-K variant. This is where the Ryzen 5 1600 makes a difference. The chip offers all the features of the 1600X, including the unlocked frequency multiplier. The only downside is having to deal with lower clock speeds, but it’s also a whole $30 cheaper. The Ryzen 5 1600 even retains AMD’s extended frequency range (XFR), a feature that allows for higher automated overclocks depending on the cooling solution being used. Furthermore, you get the Wraith Spire cooler, while the 1600X lacks stock cooling altogether.